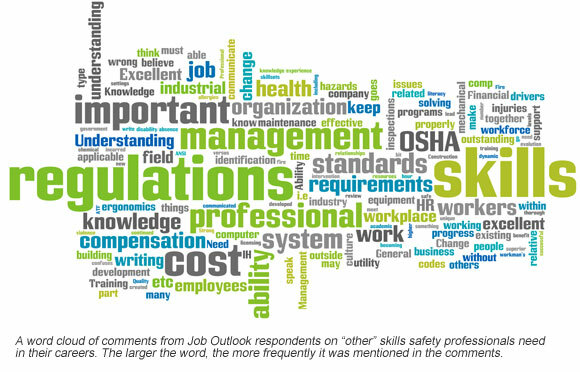 In addition to industry-specific technical knowledge, what other knowledge or skills are important for safety professionals to have? I think that all of these are on an equal playing field. Safety professionals should know a little bit of all of these things. Knowledge and experience with construction safety. Training skill – the ability to teach others in classroom settings. General Industry and Construction Standards/Regulations are more important in my line of work. Anything other than above, such as time management, ATF, DOT, DoD, Fire Department inspections, the many applicable consensus standards, etc. I deal with all safety and environmental type of regulations, from city to international. Common sense along with a healthy dose of mechanical aptitude. Critical thinking to see solutions beyond simply enforcing regulations. Excellent writing skills coupled with superior reading and comprehension skills to properly interpret applicable regulations. Need to be able to speak to the cost of workers’ compensation in all its forms (e.g., premium, cost of injuries, transitional duty and legal aspects). Be sure that safety programs developed address the leading cost drivers for workers’ compensation and intervention strategies. Involvement – An organization can only enhance its health and safety system through partnerships – senior management and employees working together to reduce injuries, insurance cost and improving morale. Getting employees intimately involved in the safety system is a key ingredient for maintaining an effective safety management system. A “we versus them” mentality will doom the safety system. OSHA and other similar industrial and occupational safety regulations. Strong computer skills, i.e., PPT, Excel, Visio, MS Office. 1st tier supplier support and community network. Building, fire, energy, mechanical, fuel-gas, existing building and property maintenance codes; knowledge of the 1910 and 1926 regulations. The ability to communicate how to meet the compliances requirements and keep a safe workplace. Risk identification and problem solving are nowhere on that list and seem to be at the top for me. It isn't ergonomics, or IH, it is risk across the board. Job ownership, including responsibilities and accountabilities. Change Management, Culture Change/Creation, LEAN and Behavior-Based Safety principles. These can all be lumped together … however, these three subjects cannot be overlooked. I think most of my colleagues and myself are engaged in these types of safety management activities more than 60 percent of our time in this day and age. The evolution of the EHS field has created workplaces that need to be in a constant state of change and improvement in order to grow and progress. Excellent writing skills; excellent work completion/effectiveness skills; excellent laboratory safety (for academic areas) skills; excellent computer skills; outstanding “self-starter/assertiveness/collaboration” skills; outstanding ability to work with multicultural workforce and aging workforce. Excellent and continued networking within and outside of one’s organization. Without these skills, one will fail in today’s workplace. Ability to develop trust and credibility by building relationships with people throughout all levels of the organization. Education – professional development, certification, employer support. In the utility industry, a safety professional must have a clear understanding of the hazards that a utility worker faces. These hazards may change from job to job and sometimes are driven by others outside of the company. Examples: weather, distracted drivers, neighborhood violence. The safety professional must know the regulations but also understand reality. Local and federal safety regulations knowledge is very important. Ability to speak in front of a large audience. Need to be able to write site-specific safety plans, company policies, procedures, etc., thorough knowledge of the workers’ comp system, OSHA, ANSI and other standards, etc. Quality, ISO Certification, Six Sigma. You cannot be an effective safety professional without the ability to lead and communicate up and down the chain. As a safety professional, it is important that you have an understanding of what the employees are working with and their attitudes toward safety. Understanding of workers’ compensation and disability/absence management relative to ergonomics and IAQ. Empowerment to do my job. Any type of specialized safety training has to rank higher than IH or HR. 1. We hire Industrial Hygienists to work exposure and industrial illness issues. 2. HR is HR; we review FECA claims and make recommendations and keep the OSHA 300, but we’re not the office of primary responsibility for workman’s comp. In every workplace there is a unique dynamic to how things are done and the safety culture within the organization. I believe that understanding and becoming an integral part of the existing culture is important to effectively identify how to progress and make improvements. Knowing the site requirements. Most industrial facilities have a series of requirements over and above industry standards. Site-specific requirements are not always communicated to the craft until something goes wrong. Impact on business due to new regulations and limitations. Understanding the full range and development of safety protective equipment, human factors as they change with generations and OSHA standards. Prepare for inspections with MSHA; keep up with all equipment maintenance. Knowledge of codes, licensing regulation, accreditation standards and government regulations. Also, budgeting and cost saving knowledge. Infectious diseases, allergies, chemical sensitivities (i.e., health issues). I believe that successful use of social media, knowledge/experience in job-related apps and data collection/analysis tools are very important now and more so in the near future. Lack of resources to properly implement and maintain safety programs. Environmental, health and safety regulations. Problem solving – too many people only point out what is wrong without contributing to the solution. The ability to function in the field or on the floor. Financial literacy related to safety and health initiatives. General management skills are very important to any safety professional who wants to succeed. Understanding workers’ compensation is very valuable. It is the true measure of a safety program. The cost of all incurred expense divided by the number of man-hours worked gives you a cost per hour. This is figured into the hourly benefit rate. If accidents go down the cost goes down.